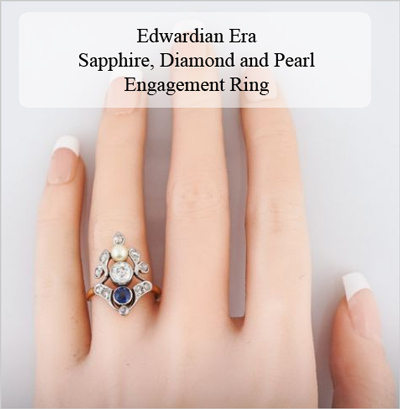 In this article we’ll explore antique rings from as early as the 1700’s right up until the end of the Edwardian Era in 1915. The era in which the ring you select was produced in will ultimately determine what material and stones were used, the primary color of the ring and the cut of the stones. 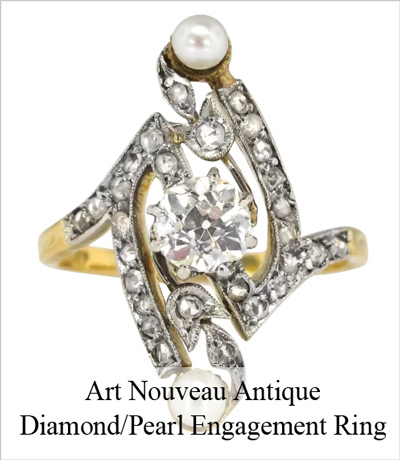 If you are looking to secure an antique engagement ring for your partner, a true antique must be at least one hundred years old and this is no exception for jewelry pieces such as rings. It is due to the age of the item and the demand of such an antique item that will determine its price. In terms of antique engagement rings, the age and demand of the item definitely impacts the price but furthermore, the cut, clarity, color and carat of the center diamond all play a role in the final price of the item. In contrast to a brand new engagement ring, an antique engagement ring has a history and often a story. Furthermore, unlike the man-made diamonds that center modern day rings, many antique rings contain natural diamonds that take billions of years to form beneath the earths surface. Some antique engagement rings may have a colored central stone rather than a diamond. If you’ve browsed some antique engagement rings and you can’t find the perfect ring that fits into your budget, vintage or retro engagement rings produced between the 1940’s to roughly the 1960’s may be a better choice for you. Alternatively, antique look alike rings are commonly found in modern jewelers due to the interest in Victorian era rings. Why do Couples Choose Antique Rings? Many antique enthusiasts love the story behind an antique ring. The ring was once worn by another whether it be someone famous or just another who was truly in love. An antique ring can carry a piece of history with it. The price of rings these days often don’t reflect the weight or quality so some turn to second hand or even antique rings. Surprisingly some antique rings are much more affordable in terms of weight, color, cut and quality. Furthermore, antique rings were hand crafted. Many man hours went into designing and crafting the ring. Some of the intricacy of antique engagement rings is impossible to find in today’s machine produced rings. 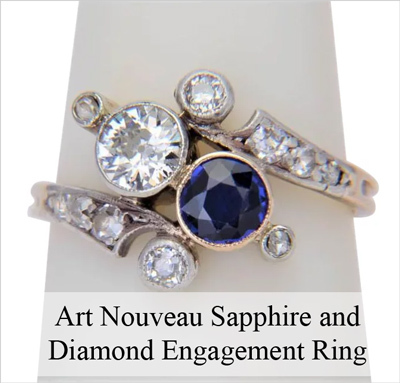 If you are looking to make an antique engagement ring purchase, specialty antique retailers, estate sales and pawn shops often have a number of antique rings for sale. Be careful when choosing a ring as some may have damage due to age, be missing stones or even have engraving from loved ones. If you have your heart set on securing an antique engagement ring for your loved one, there are a few things to consider prior to purchasing. Due to the age of the ring, many of these will not come with certifications unlike the rings that you can purchase from modern day jewelers. This means that it is up to the purchaser to do their due diligence to ensure the ring does warrant the cut, clarity, color and carat that the seller is describing it to have. 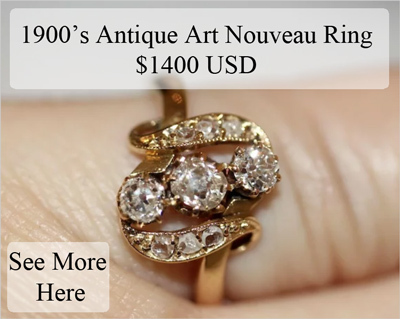 While buying an antique engagement ring from a private seller comes with some risk, much of this risk can be eliminated from purchasing from a well known antiques dealer such as Ruby Lane. If you are purchasing an antique engagement ring, the pure age of the ring may mean that it has deteriorated over time. Ensure that the diamond seems to be securely held in place and have it looked at by a trained professional if the antique ring is being sold privately. While some antique rings may only retail for $1000.00 USD others can be over $20000.00 USD. When purchasing an antique engagement ring it is a good idea to consider if you are paying due to demand for the ring, the actual quality and weight of the ring or only due to the pure age of the ring. 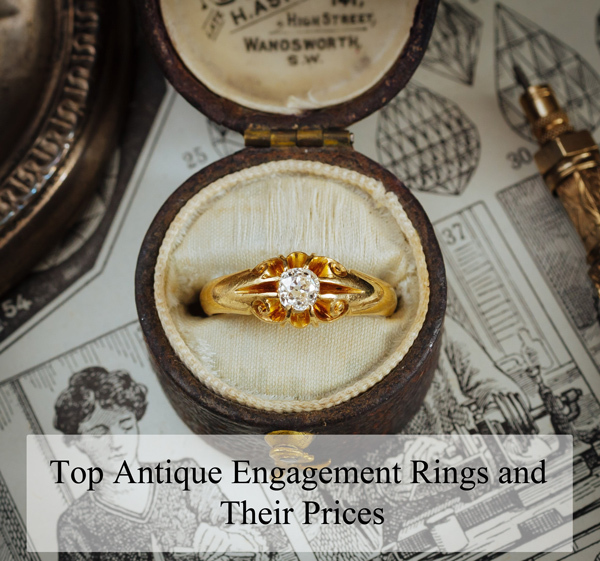 If your partner is not an antiques enthusiast and just prefers the style of antique rings opposed to modern day solitaries, a vintage engagement ring or an antique style ring may be a better choice in the long run. If the ring is not a perfect fit ensure that it can be resized prior to making the purchase. Due to the fragile nature and intricacy of antique rings, sometimes it makes them impossible to resize. 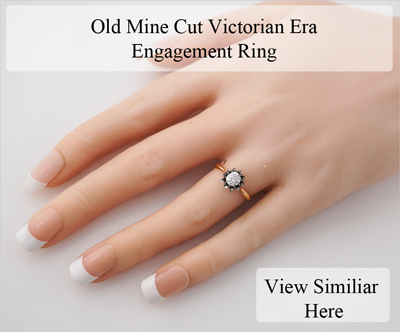 Many of the reputable online jewelers who deal with antique rings will be able to tell you if resizing is a possibility or not. 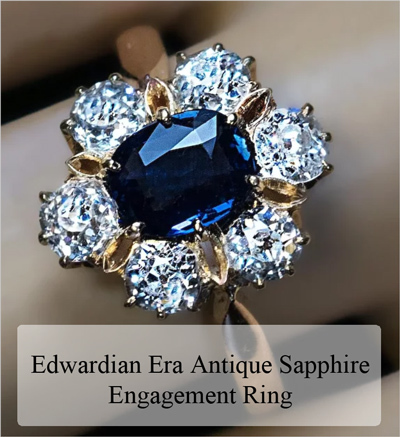 If you are looking for an antique engagement ring during the 21st century, those produced during the 1900’s and earlier can be classed as antiques. 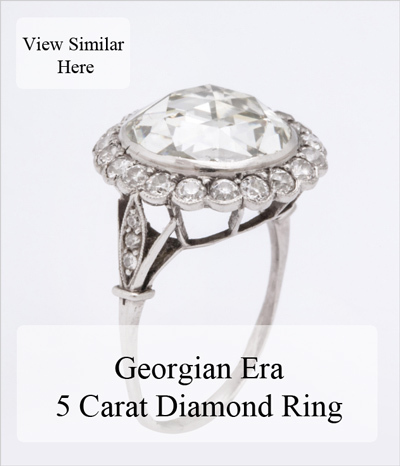 Antique engagement rings can be classified into eras. 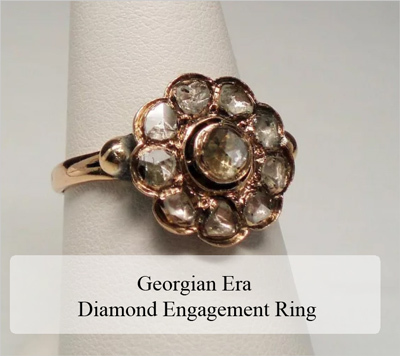 Rings produced in the Georgian era from 1714 until 1830, rings produced during the Victorian Era from 1835 until 1900 and engagement rings made during the Edwardian Era from 1900 until 1915 all fall into the antique category. Once you begin to browse you may notice the effect the era has upon the ring. 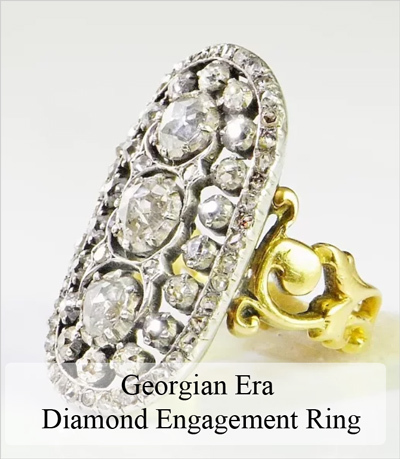 For example engagement rings from the Georgian era were made from 18 carat silver or gold and often rings were made to suit the stones that would be used, while those rings produced during the Edwardian era feature the finest craftsmanship and are crammed with diamonds. Below we’ve described the classic look and feel of antique engagement rings from each of the four eras; Georgian, Victorian, Art Nouveau and Edwardian. King George I, II & III) 1714-1830 – Extremely Rare. Many were Melted or Destroyed over the Years. – Silver was Most Commonly Used. Generally 18k plus. – If Yellow Gold was Included, it will be Either 10k, 18k or 22k. – Yellow Gold and Silver were Used. Steel and Rose Colored Gold became popular Towards the End of this Era. – Stone Cuts Included Rose, Old Mine and Step. Art) 1880-1910 – Shell and Copper may be Included. White Gold was Introduced. – Stone Cuts included Old Mine and European Cuts. – Floral Patterns as well as Moon and Stars May be Included. – Multiple Metals Used in the Same Ring. The time period in which the engagement ring was designed and hand crafted often decides what the primary color and shape of the ring is. Early cuts include the rose cut that creates a rounded stone, a step cut that creates a square or rectangular stone and the old mine cut that produced a rounded square stone. The metal that the stones were then set in again depends on the era. During the 1700’s silver was commonly used to set diamonds in. The reigns of an era also impacted style such as Queen Victoria’s love for blues and turquoise that saw many of the rings produced during the Victorian era including some shade of blue. Georgian Era engagement rings are hard to come buy whether that be online or at antique jewelry shops. This is due to the fact that many of these rings have been melted down or have become damaged over the centuries. While Georgian Era engagement rings may be beautiful and hold a piece of history in each, these rings are not recommended for every day wear due to their delicate nature. This ring cannot be passed by with it’s 5 carat rose cut diamond. This diamond is foil backed which matches the era in which it was crafted. 18 carat gold is used for the band, and only minimal wear is apparent considering the age of this ring which dates back to 1820. This ring was crafted during the early 1800’s falling into the Georgian Era. The central rose cut diamond is the statement of this piece that was crafted using both sterling silver and 14 carat gold. For a 200 year old ring, the condition is impeccable minus a small chip to one of the diamonds. Within the entire ring, the diamonds add up to be approximately two and half carats. If you are proposing to a woman who loves her jewelry big and bold, this Georgian Era ring crafted in the 18th century is hard to pass up. Featuring an 18 carat yellow gold band and a sterling silver top, each diamond was hand cut in a rose shape. There are many different sized diamonds in this ring totaling just over 4 carats in weight. This piece is truly fantastic. Antique ring collectors often will tell you that the Victorian Era pieces are among their favorites. This period was named after Queen Victoria who happened to be quite a romantic and this was displayed through the crafted pieces of this time. Towards the end of this era when the queen’s husband passed, many of the jewelry is dark to reflect her mourning. Hand crafted towards the end of the 1800’s, this Victorian Era ring was created using both sterling silver and 14 carat yellow gold. The old mine cut center diamond within this piece is 0.65 carats. 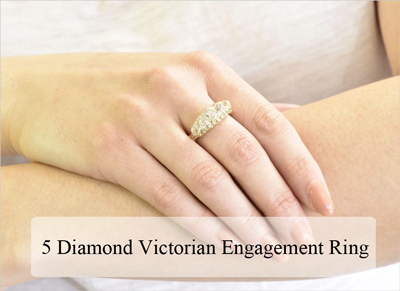 Thought to have been made in 1890, this 5 diamond engagement ring is simple yet elegant. In total 3.55 carats of mine cut diamonds are set in 14 carat gold. All diamonds sit between I and J in color with the majority of them VS1 clarity. This 18 carat old cut diamond engagement ring features one large central pearl. 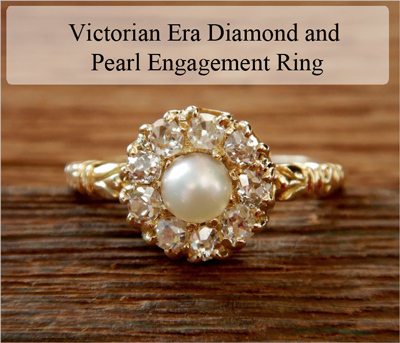 Crafted between 1880 to 1900, this Victorian Era engagement ring features a halo of 9 nine diamonds that create a focus on the possibly natural pearl. The hand cut diamonds within this piece are bright and white that contrasts with the yellow gold band to make the perfect statement engagement piece. Art Nouveau rings focus on organic shapes such as the female form, flowers and insects. It is within this period that some of the most famous and highly sought after antique rings were produced. This beautiful Art Nouveau Engagement Ring was crafted during the early 1900’s and features an 18 carat yellow gold band. Weighing in at 3.5 grams, the top of this ring stands out with three well sized old cut diamonds. The central diamond within the antique ring weighs in at just over half a carat. This ring accurately represents the period in which is was hand crafted. 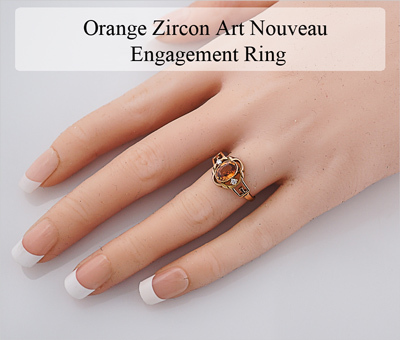 A unique non-traditional engagement ring that features a rare orange zircon in 14 carat yellow gold. On either size of the statement stones sit two white diamonds. Crafted between 1890 and 1910, this piece can make the perfect antique engagement ring. This hand made ring produced during 1890 features a European diamond set that crosses over with one old cut sapphire. While the stones within this piece are set it in sterling silver, 18 carat gold was used to create the band. While this ring does show some signs of wear and tear, it is in great condition considering its age. This is a unique engagement ring produced during the early 1900’s. The central stone in this ring is an old European cut diamond that weighs in at just over half a carat. Smaller diamonds then follow the intricate shape of the ring. Two cream colored pearls sit top and bottom of this ring completing the symmetry of the design. The top of this ring was crafted from platinum while the band is 18 carat gold. 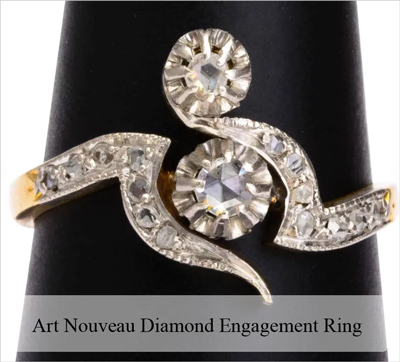 Crafted during the early 1900’s this diamond engagement ring represents the Art Nouveau period perfectly. The band of this ring is 18 carat yellow gold while the top is platinum. 16 white and bright rose cut diamonds are feature in this ring. The Edwardian Era was a period of sophistication and pure elegance. Platinum began to be used regularly and this meant that due to the strength of the metal, more intricate details on rings were possible. The rings from this era tend to be full of diamonds and have a very feminine feel to them. 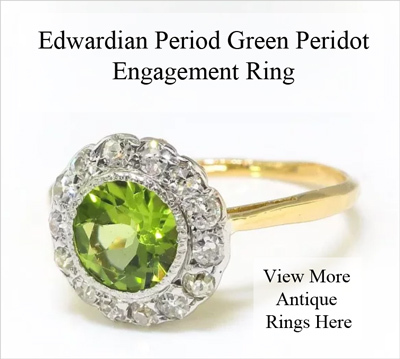 If you are happy to shy away from the traditional center white diamond, this green Peridot ring is not only rare but is also stunningly beautiful. Crafted in 18 carat yellow gold, the center stone is bordered by a halo of white diamonds. Produced somewhere between 1910 to 1920, the overall floral shape of the ring fits well into the Edwardian era. The total weight of the central Peridot and the 14 diamonds is 1.42 carats. This ring is truly stunning with details from the tip to the base. Weighing in at over 3 carats, the only and central diamond of this piece can be seen from a far. The band of this ring displays elegance and extreme craftsmanship with a floral leaf patterning. This ring is an antique version of today’s solitaires. The central diamond is ‘L’ color and SI2 in clarity. 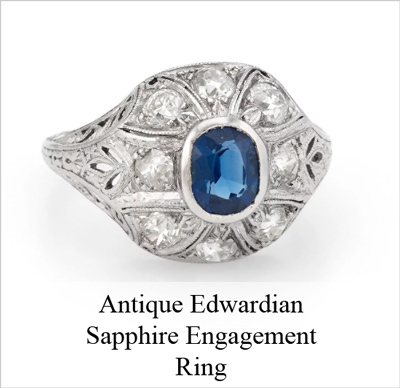 This Edwardian Era engagement ring is not only an antique but is also a work of art. Crafted during 1910, this 14 carat gold ring features a 0.84 carat bright blue sapphire surrounded by 6 cushion cut diamonds. The diamonds in this ring range from G to H in color making these white to the naked eye and are ranked SI in clarity. Very common of the Edwardian Era, the gold openwork petals make this ring look like a flower. 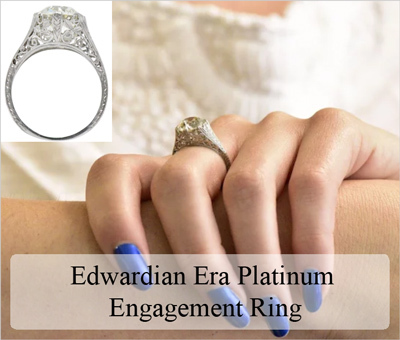 Approximately handcrafted during 1910, this possible engagement ring is made of pure 900 platinum. An almost one carat oval cut sapphire is the heart and soul of this ring surrounded by 8 mine cut diamonds. Tiny flowers and intricacy make the band of this ring all the more special. For the era in which this ring was crafted, minimal wear and tear is visible to the naked eye. Crafted in the early 1900’s this is a unique engagement ring that differs in the way three central stones are the focus rather than one. Within the center on this ring, a half carat mine cut diamond is wedged between a blue sapphire and a pearl. 10 rose cut diamonds follow the swirling pattern on the outer edges. This ring is crafted with both platinum and 18 k yellow gold.